A new member of the Clinton family was born late Saturday, as Chelsea Clinton, the daughter of the U.S. Democratic virtual nominee for president, Hillary Clinton, announced in social networks the arrival of her second child. Chelsea Clinton is married to Marc Mezvinsky since 2010 and their first child, Charlotte, is two years old. Aidan, the newest baby, was born in New York, at Lenox Hill Hospital in Manhattan. Chelsea is the author of the book. It’s your World and is the Vice-Chair of the Clinton Health Access Initiative Corporation, a global health organization committed to expanding access to health care and health systems. Chelsea is the only daughter of former President Bill Clinton and wife, Hillary. She earned her B.A. at the Standford University, where she met his now husband and father of her children, Marc. She later received her Master in Oxford. Chelsea was born in Arkansas but after a short period, she was raised in Washington D.C., during her father’s presidential period. She is an active member of several boards across the country, mostly in foundations and medical-education related institutions. She and her family are now stablished in New York. Marx Mezvinsky, on the other hand, is an investment banker son of a couple of former congressmen, Edward Mezvinsky and Marjorie Margolies. The Mezvinsky family is Jewish; therefore, there are a lot of speculations around the religion the family will adopt to raise their children. Declarations about it have not been made by any member of the household. 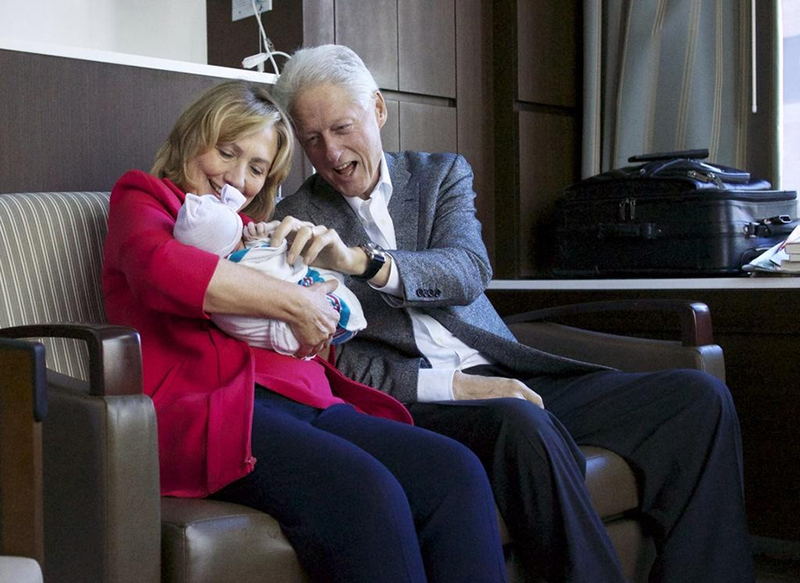 Hillary Clinton and Bill Clinton have expressed their joy with the arrival of a new grandchild. In a campaign event, the virtual presidential candidate said that she understood the impact of being a grandmother just when it happened to her. “It is truly like falling in love all over again. There is nothing like it. It’s transformational and until you did it, it is hard to know, and it has for me been an absolutely life-changing experience. We are overjoyed to be grandparents again with the arrival of our grandson. We are all over the moon as Chelsea and Marc welcome Charlotte’s little brother to the world and grateful for our many blessings. Chelsea and Aidan are both doing well and enjoying this very special time together,” said the candidate.